Mushroom Bruschetta (pronounced as brusketta) is easy to make and is wonderful as an appetizer and as a light breakfast. Learn to make Mushroom Bruschetta following this easy recipe. Slice Baguette diagonally into 1″ slices. Preheat oven at 180 degree C (broiler mode). Place the bread slices on a baking tray and toast until golden brown and crisp. Alternatively, you can also toast it in a toaster or skillet brushing a little olive oil. Remove from oven and rub the bread slices slightly with a peeled garlic clove when hot. Heat olive oil in a pan, add minced garlic and chopped mushrooms. Cook the mushroom for a few minutes on high heat stirring constantly. Add few drops of balsamic vinegar and cook for a few more seconds. Add thyme, salt and pepper powder to taste. Garnish with parsley (optional) and remove from heat. Spoon the mushroom mixture on top of the toasted baguette slices. 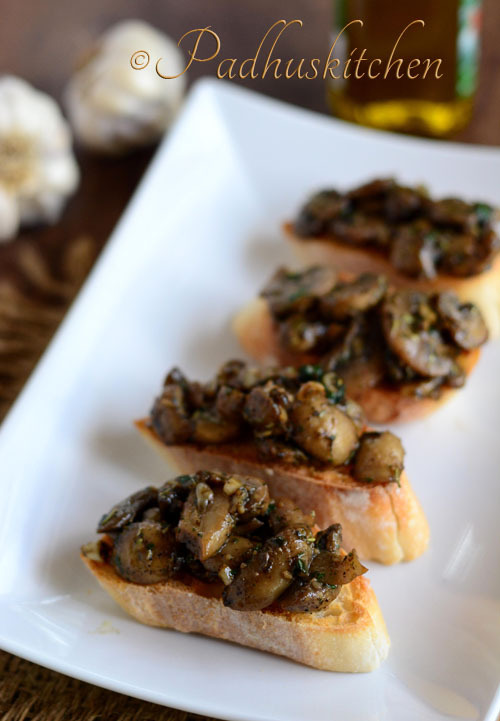 Drizzle a little olive oil and enjoy mushroom bruschetta immediately. Check out my Tomato Bruschetta recipe and more World Recipes.